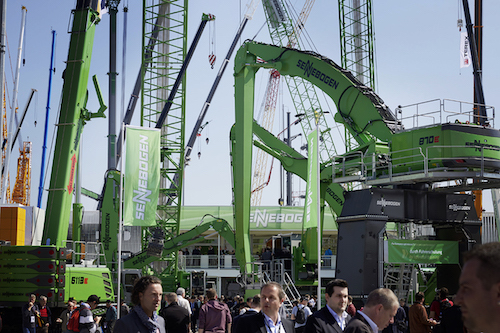 For its 60th participation at Bauma, the Bavarian machine manufacturer Sennebogen will reveal the new 895 E material handler for the first time to the public. The machine will be presented at Sennebogen’s production site in Straubing thanks to daily shuttles from the stand. This machine has a operational weight of 390 tonnes and reach of up to 40m. The manufacturer also unveils the new 6133 E, the largest telescopic crane in Sennebogen’s range to date with a 52m main boom and a maximum working load of up to 130 tons. Numerous other equipment, including the new 355 E telehandler with a capacity of 5.5 tonnes, the 875 E dedicated to port applications with ranges of up to 27m and a load capacity of 7.5 tonnes, will also be exhibited on more than 2000m2 of the brand’s floor space.